2nd January 2019. A woman who has dedicated 15 years of her life to the National Coastwatch Institution has had her efforts recognised at an annual presentation evening in St Just. Elsie Ash joined the NCI Cape Cornwall team as a watchkeeper but soon expanded her service to the national charity by becoming a stalwart of the fundraising team, frequently seen collecting at supermarkets, local events and even along Penzance seafront. 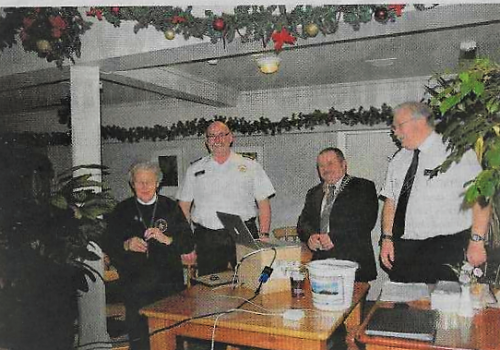 Over the years, Elsie has raised many thousands of pounds to help continue the running of the watch station, which relies on public donations. To mark her achievement, Elsie was presented with a long service certificate and badge during the annual NCI Cape Cornwall presentation evening, which was held at the Commercial Hotel in St Just. Elsie was presented with the award by Mike Smith, Manager of the NCI National Office in Liskeard and Brian Clemens, the Mayor of St Just. During the evening Mr Clemens and his wife Val, who own Clemo’s Pets and DIY store in St Just, also made a donation to the Station. Over the past year they have been raising funds for NCI Cape Cornwall through the delivery charges on goods to their customers and have raised a total of £1,054.